Digital Camera Resource Page: If there was ever a camera that deserves the clich – “chock full of features”, the R927 is it. It has scene modes, manual controls, and multiple help systems. Want to add borders around your photos? Done. Want a photo of your cat turned into a Seurat painting? No problem. The camera’s Adaptive Lighting system will brighten up your dark photos, though you’ll be restricted to smaller print sizes. The Image Advice features gives you hints about improving photos that you have taken, and you’ll find a help screen for each menu item (and then some). Photos can be tagged for e-mailing, printing (locally or through Snapfish) or online sharing. I don’t care for how the photos aren’t directly e-mailed to the recipients, though. If you want to record movies, the R927 does that too, though not as well as the competition. While it records at 640 x 480, the frame rate is slower than on the competition. Unlike most cameras you can zoom during filming on the camera, but you’ll hear the noise of the zoom motor in your movie. Photo quality turned out to be the R927’s weak point. While the camera took well exposed photos with vibrant colors, I was disappointed with the amount of noise and purple fringing on my photos. While these issues won’t make a difference if you’re making 4 x 6 inch prints, you will notice them in 8 x 10 prints or when viewing them onscreen. Redeye will not be a problem if you turn on the camera’s software-based redeye reduction system, though that will slow down shot-to-shot times a bit. If you want a camera that’s easy to use and takes photos best suited for small prints then I’d recommend looking at the Photosmart R927. If you’re going to be making larger prints, the noise and purple fringing will be an issue, so I’d probably look at other cameras. Same goes for those who like burst modes: since the camera’s LCD is dark during continuous shooting (and there’s no optical viewfinder), it’s kind of hard to follow your subject! 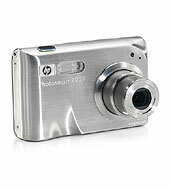 DigitalCameraReview (dead link) concludes that the HP Photosmart R927 provides a vast array of options and capabilities neatly packaged into an easy to use device. It’s solid enough for advanced use, and easy enough that someone with no prior experience can pick it up and go. All in all, I’d call it a very worthwhile camera for the money, whether you’re looking for a simple and effective means of snapping a few casual pictures, or you’re an hobbyist wanting more powerful equipment without sacrificing usability. R927 us a solid camera for basic or prosumer use. Digital Camera Tracker (dead link) reviews HP R927 and concludes with overall score of 8.5 out of 10 that “HP’s Photosmart R927 is one fun camera to take pictures with. Menu navigation is without a doubt one of the easiest I’ve seen. Easy navigation combined with the 3 inch LCD makes for larger than normal print, which makes it SUPER easy to read. With that said if you will be making large prints you might be dissatisfied with the purple fringing issue. Otherwise, the R927 records well exposed photos with rich colors. Digital Trends (dead link) concludes with rating of 8 out of 10 that anyone looking for a compact, attractive 8MP point-and-shoot digicam should give this camera serious consideration. Although the R927 had some flaws, the large LCD screen, the great menus, the built-in special effects and – most important – the photos it took put it on the plus side of the ledger. Still for the next go-around HP engineers should figure a way to juice up the time it takes to save a shot. And for God’s sake, put a video out on the supplied dock rather than forcing buyers to shell out another $80 for an accessory.